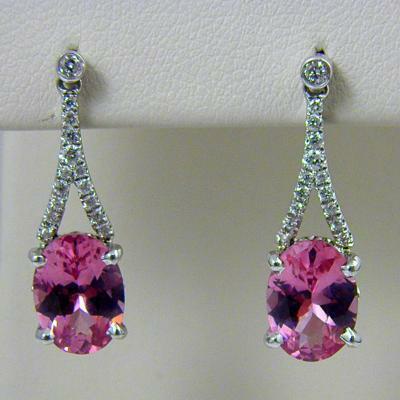 These earrings feature some of the nicest pink Spinels we have ever carried. While not the largest or darkest they have the most pure bubblegum pink hue you could hope for. We set them in elegant diamond-encrusted dangle mountings so that the gems dangle approximately 1/2 inch below the ear. The gems in these earrings are from an unusual source in Tajikistan. 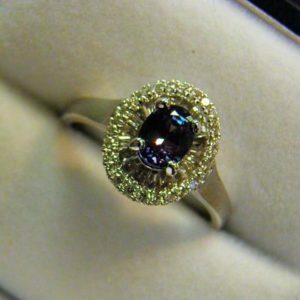 This region produced Spinel for hundreds of years, but the production ceased when the region fell under communist rule. The mines were rediscovered in the 1990s and these stones came to us at that time- we had simply been biding our time for the perfect mounts to set them in. Details: 14k white gold earrings set with 3.40cttw oval pink Spinel and .24ct diamond accents (SI GH). This unique piece sold. 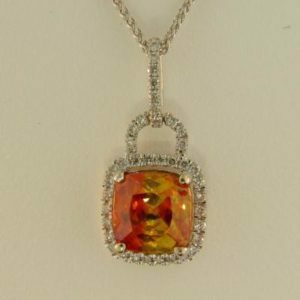 Please contact us for pricing and availability of similar items.